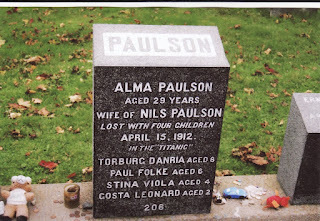 I have always had a deep interest in the Titanic, it's history, victims and her survivors. My dear friends Michael and Linda, (in 2009) returned from a cruise that took them from New York to Halifax, Nova Scotia, where they toured the Fairview Lawn Cemetery in Halifax. They then when onto Quebec, Canada. 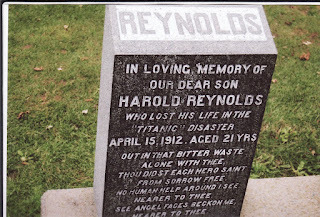 Knowing my passion and love of family history, genealogy, cemeteries and the Titanic ~ they gifted me with these photos from their tour of headstones from several victims that perished in the Titanic disaster. Thank you Mike and Linda, you are the best! Commissioned by The White Star Line, the construction of the Titanic began on March 31, 1909 by shipbuilder Harland and Wolff's Belfast, Ireland, yard. The Titanic's maiden voyage was on April 10th, 1912, approximately at noon. On April 14th, 1912, at approximately 11:40 p.m., the Titanic's starboard side scraped past an ice burg, causing a series of small punctures below the waterline. Water began rushing into the Titanic's hull. Around midnight, Captain Smith gave the orders to ready the lifeboats. The first lifeboat was lowered into the ocean at 12:45 a.m. The band, led by, Wallace Hartley, continued to play as passengers filled the lifeboats. The last life boat left at 2:05 a.m., there were still 1,500 passengers stranded on the ship. Shortly afterward at approximately 2:10 a.m., the Titanic's bow sinks further underwater. At 2:17 a.m. the stern rises out of the water, causing a strain and the bow and stern break apart, landing 2,000 feet away from each other. At 2:20 a.m., the Titanic slips from view and sinks to the bottom of the ocean where she lays at rest today. April 17th, 1912, Mackay-Bennett chartered by White Star Lines, leaves Halifax, Nova Scotia, for the North Atlantic to start recovering victims' bodies. 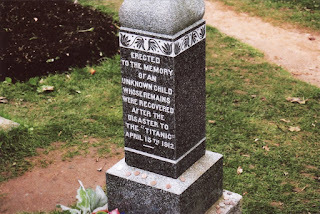 April 21st, 1912, the Mackey-Bennett crew begins recovering over 300 bodies in six weeks, one-third are buried at sea. 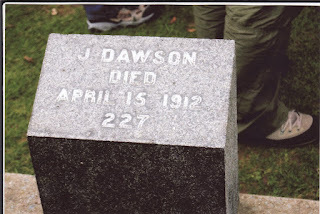 On May 3rd, 1912, burial of victims begin at Halifax cemeteries. About 50% of the 150 bodies buried were unidentified. I am not related to any persons named in the photos above (as far as I know). The photos used in this post were taken by Michael and Linda B. and given to me with full permission to use on Ginisology Blog. I can still remember the first time that I had ever heard of the Titanic. I instantly became interested in it. When I visited the east coast, we went to a couple of places that were the first places in Canada to have received signals from the Titanic. It was really interesting.